WASHINGTON -- The final note of the national anthem hit and Kevin Love went over to the nearby basket, grabbed the rim and swung back and forth. After a 50-game absence, Love was officially back. Sidelined since late October following surgery on his left foot, Love’s return was brief. He played six minutes and 29 seconds before being subbed out for Ante Zizic. 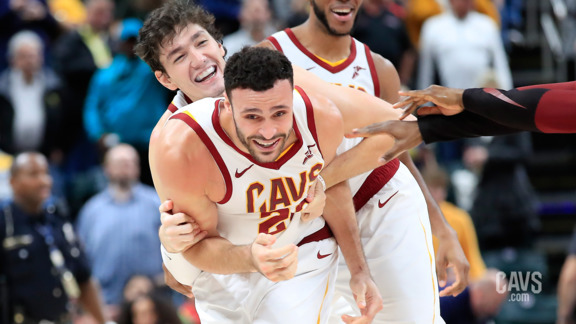 Moments later, Love jogged down the tunnel that leads to the visitor’s locker room, waved to a few fans wearing Cavaliers gear in corner seats and stayed in the back for the remainder of Cleveland’s 119-106 loss to the Washington Wizards. “It was fun to be out there,” Love said following his comeback game. “This is my 11th year and I’ve seen a lot, done a lot, but coming back off that was a weird feeling. Felt good to be back out there. I have enough suits to get me through three months, but I’m tired of wearing a suit every game and just sitting out there so I was happy to wear some different street clothes in here and throw the jersey on and I know it was only six and a half minutes, but it felt good.” - CLICK HERE to read full story. 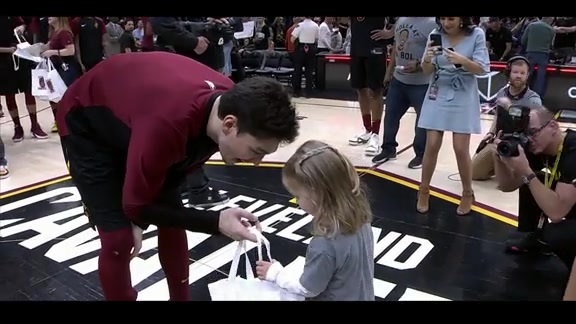 Since then, the Cavs have ... - CLICK HERE to read full story. That was the same sight back on Jan. 31 following practice. Earlier that day, Love took part in his first full-contact 5-on-5 session. Months in the making, it was the biggest step following surgery on his foot. - CLICK HERE to read full story.